Nathan Shipley, PPE Group Certification Manager at BSI explores Personal Protective Equipment (PPE) and how to prevent eye injuries in the workplace. Ensuring that employees are safe at work must be a high priority for all organisations, regardless of industry. According to the HSE1, £14.9 billion is the estimated cost of injuries and ill health from working conditions and 31.2 million working days are lost each year. Whilst this can have a considerable impact on businesses, ultimately organisations have a responsibility to look after their people. Most incidents in the workplace can be prevented if the correct level of protection is provided. Protective eyewear is just one of the most common types of Personal Protective Equipment (PPE) and an important part of self-protection in the workplace. There is an ever-rising need for organisations to comply with health and safety regulations, therefore professionals need to explore the use of PPE. However, with so many different types of protective eyewear on the market – each with its own use and application, how do organisations invest in the right protection? PPE encompasses hundreds of products that stretch from head to toe, from protective clothing, helmets, hearing and respiratory protection to body armor and boots. Connection systems (for equipment referred to in point 1) that are not held or worn by a person, that are designed to connect that equipment to an external device or to a reliable anchorage point, that are not designed to be permanently fixed, and that do not require fastening works before use. To keep employees safe in the workplace and reduce health risks, eye protection has to comply with all the requirements of the PPE Regulation and carry the CE marking to be sold legally in the EU. Exceptions to this rule are eye protectors specifically designed and manufactured for the armed forces and police officers, as well as helmets and visors for users of two- or three-wheeled motor vehicles, although even here there will be specific requirements covering those products. What is the PPE Regulation? The PPE Regulation (EU) 2016/425 recently superseded the PPE Directive, which was revised in order to reflect current technologies and processes for developing and bringing PPE to the market. The regulation replaced the PPE Directive on 12 February 2016 and was published in a document called the Official Journal. The new regulation applies from 21 April 2018, with a one year transition period until 21 April 2019. All PPE manufactured after 21 April 2019 will need to comply with the new Regulation. To ensure eye protectors are fully compliant, products have to be certified to the requirements of the Regulation. This can be done through testing the product to a published harmonised standard or to a manufacturer’s own technical specification. Harmonised Standards are listed in the Official Journal, which is held on the European Commission website and is a ‘live document’ therefore updated on a regular basis. What eye protection should you invest in? There are many different types of protective eyewear on the market – each with its own use and specific application – including swimming or squash goggles, sunglasses, safety spectacles, welding shields and special mesh face screens designed for forestry. The PPE Regulation groups all products into three main categories (Simple, Intermediate and Complex) – depending on the level of risk in the workplace and the protection eyewear needs to provide in these circumstances. Neither complex nor simple, protective eyewear in this category includes welding shields and safety spectacles. These products should be certified by a Notified Body to prove that they meet the technical requirements of the PPE Regulation’s relevant specifications. Eye and face protection comes in many forms - there are spectacles that can come with prescription lenses, goggles that enclose the eyes, and face screens which can offer higher levels of coverage and protection. As well as these types of eyewear, there are also welding screens, mesh visors for forestry applications – even swimming goggles and sunglasses are classed as PPE products. All category II PPE eyewear offers some form of mechanical protection but to different levels. There is also a range of optional claims that can be made and are marked onto the products. These are explained in the table below. PPE eyewear can have light filtering characteristics too, these can be for use as UV, Infra Red or sunglare filters, as well as welding. If the eyewear is claiming this they are provided with a code number and the filtering level provided, so a UV filter may appear as 2-1.2 and a welding filter as 5. When it comes to distributing PPE in the European Union (EU), all products that fall under the European Regulation must carry the CE mark. This is a legal requirement and means that manufacturers are allowed to do business in all 28 EU member states. For instance, once a CE approval has been issued in the UK the product can be sold across Europe – from Portugal right through to Greece. If a product bears the CE marking, it has been assessed against the essential safety performance criteria as specified in the EU Regulation. This mark also acts as the manufacturer’s confirmation that the product adheres to the specific requirements of all the Directives that apply to it and that it can be sold legally in the EU. Previously the PPE Directive focused only on manufacturers placing products onto the market, but the new regulation means the whole supply chain is involved. This means importers, distributors or anyone involved in the supply and distribution chain should take appropriate measures to ensure that PPE meets standard requirements and that they make available on the market only products which comply with the Regulation, and keep relevant documents for at least 10 years. BSI’s status as a Notified Body for many European Directives and Regulations enables it to offer third party testing and factory production control assessments, where products require it, and can offer support for PPE manufacturers wishing to CE mark their products. The level of involvement of BSI is determined by the Category the product falls under in the Regulation. There are some excellent eye protection products available on the market, however there are also numerous counterfeit and illegal products. Invariably, such fakes do not perform as they should, put employees’ lives at risk and expose their organisation to prosecution. From laboratory and to factory floor, PPE is vital to workplace wellbeing and it is imperative that it meets or exceeds health and safety standards. The new Regulation will help prevent companies from selling sub-standard PPE without being accountable. Under the new Regulation, any company importing or distributing PPE products will have to ensure they meet the Regulation and keep records. How is protective eyewear tested? Protective eyewear is divided into three groups – spectacles, goggles and face shields – with each type of eye protector offering a different level of protection. In addition to certain design, manufacturing and other basic requirements, eyewear standards also include optional specifications that protect employees from unfavourable conditions. These include resistance to abrasion or fogging, and higher levels of protection against an identified health and safety hazard. Since these standards are hazard based, they incorporate a number of mechanical test requirements which have been developed around the specific fields of protective eyewear use. For example, eye protectors are tested for robustness and their ability to protect employees against high speed particles. The products’ robustness is put to the test by dropping a 22mm steel ball from a height of 1.3m onto the lenses and for lateral protection. To see if an eye protector would safeguard its user against high speed particles, 6mmsized ball bearings are projected onto the eyewear at one of three impact velocities, depending on the level of protection claimed. This test can also be done in extreme temperatures (+55°C and -5°C) to represent authentic working conditions. In cases where workers are exposed to splashes of molten metal, another optional test should be carried out to measure the eye protector’s ability to withstand such a hazard. In this particular test, 100g of molten grey iron (1450°C) and aluminium (750°C) is projected onto the eye region. To see if eyewear can withstand the penetration of hot solids, a 6mm ball bearing, heated to 900°C, is applied to the surface to determine the time it takes to pass through the material. Additionally, to make sure eyewear does not interfere with the user’s vision while performing their tasks, the lenses (oculars) are also tested. 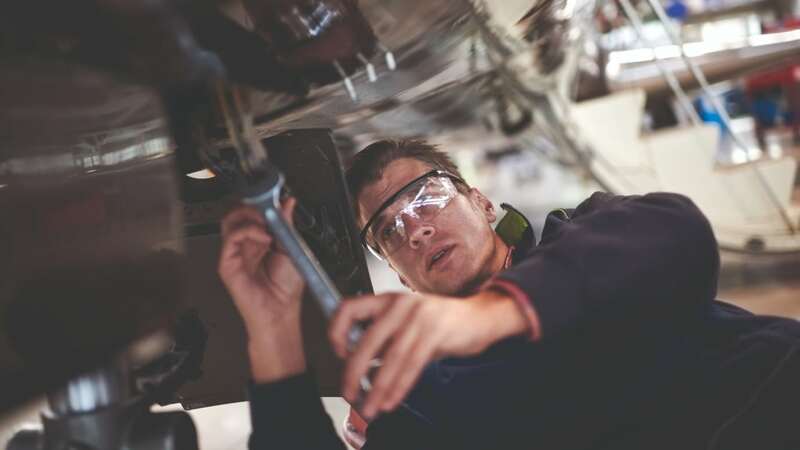 Keeping employees safe at work may seem complicated, however by understanding what PPE is available and what to look for when it comes to eye protection, many incidents can be prevented. Certification to key product standards can help PPE manufacturers clear regulatory hurdles, while differentiating their proven products from poor quality competitors and fakes. Most importantly, however, it will give the peace of mind to consumers and commercial buyers that the quality, safety and reliability of PPE products is guaranteed.